These are the key facts for the leading riders on the Moto3™ grid at the Gran Premio d'Italia TIM. 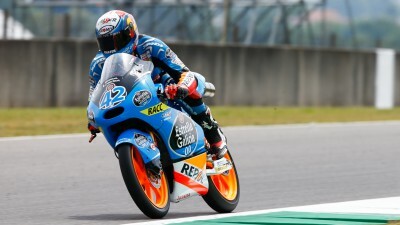 - Alex Rins is on pole for the first time since the opening race of the year in Qatar. He will be aiming to win for the first time since the Australian Grand Prix last year. - Jack Miller has qualified in second place on the grid to maintain his record of starting from the front row at every race so far in 2014 having never previously been on the front row prior to this year. - Jakub Kornfeil is in third place on the grid – his first front row start in what will be his 79th Grand Prix. This is the best qualifying result in any class of GP racing for a Czech rider since Lukas Pesek was in third place on the grid for the 125cc race at Phillip Island in 2007. - Romano Fenati heads the second row of the grid, which is his best qualifying result since he was in fourth place on the grid at Aragon in 2012. - Alexis Masbou, who starts from fifth place on the grid, will be aiming to improve on his previous best result at Mugello which is 12th that he has achieved on three occasions. - Alex Marquez, who takes the final place on the second row, finished fifth last year at Mugello but was just 0.819 seconds behind race winner Luis Salom. - Karel Hanika heads the third row of the grid – his best qualifying result so far in his debut season in Grand Prix racing. This is the first time that two Czech riders have qualified in the top seven places on the grid for a grand prix race since full records began in 1974. - Juanfran Guevara is in eighth place on the grid, which is his best qualifying result in Grand Prix racing.